The best part about serving two days of jury duty in Madison County, Alabama? I found a source of Chick-O-Sticks. 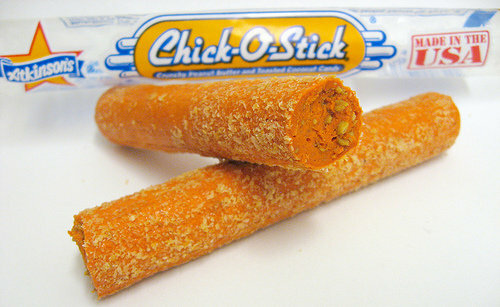 Chick-O-Sticks, for the terribly undersnacked, are orange sticks mostly made of peanut butter, granulated sugar and corn syrup. Dusted with ground coconut, they taste like the orange insides of a Butterfinger, for lack of a better comparison. They’re crunchy and delicious, and they used to be much more widely available. Lately, they seem to only pop up in small, locally owned grocery stories and Mississippi gas stations. You’ll find the large, cigar-shaped variety of Chick-O-Sticks in downtown Huntsville across from the courthouse at Harrison Brothers Hardware, which is part museum, part store. They’re displayed with a bunch of other old-fashioned snacks, including MoonPies and Necco Wafers. I’m excited to see that the Atkinson Candy Company is still making Chick-O-Sticks in a variety of sizes and packaging options; hopefully that means they’ll be around for a while. Because there’s nothing like a taste of childhood on a hot summer day.